John Locke was born in England on the 29th of August in 1632. His father was a lawyer who served during the English Civil War. The family were strict puritans, and were based in Somerset. Locke was sponsored to attend Westminster School, and then went to study at the University of Oxford. Locke was frustrated by much of the classical curriculum, and was far more interested by the writings of philosophers like Rene Descartes. What he read during university set the stage for the rest of Locke’s life. 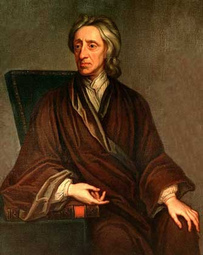 Locke is best known for being a philosopher and is thought to be one of the most influential thinkers of his time. He was one of the first empiricists, which means that he thought that knowledge can only come through experience, and that evidence is needed to prove theories. Many of his ideas and theories followed the thoughts, and traditions of Sir Francis Bacon, who was one of the first influential philosophers. A key area that Locke developed was the social contract theory, which is the view that people have to agree to follow the rules, and regulations set by an authority figure in order to form a functioning community. In his famous work, Two Treaties on Government, he argued against the rule of an absolute monarchy, which was common at the time, and instead favored a monarch that ruled with the consent of the citizens. These ideas were considered revolutionary in his time and generally viewed as major inspirations of the Age of Enlightenment. Locke’s ‘theory of mind’, is another influential and important theory because it helped people to understand the concept of identity. The theory also explained how the ‘self’ can be defined via a number of stages of consciousness, whereby babies are born with a mind that is blank, and experiences let us learn. This theory was contrary to pre-existing ideas from Cartesian philosophy and as a result, like many of Locke’s theories, the theory of self was used later by philosophers like Hume and Kant. As a result of his influence, and revolutionary thought, Locke is often called the ‘Father of Liberalism’. Many of his writings have heavily influenced later philosophers like Jean-Jacques Rousseau and Voltaire, as well as the liberal theory that was used to create the United States Declaration of Independence. As well, many historians have argued that Locke’s ideas helped lead to and influence the outbreak of the French Revolution and the central principles of the Declaration of the Rights of Man. Locke died on the 28th of October in 1704.